Jaber, S. M., Md Shah, U. K., Mohamed Asa’ari, A. Z., Ariff, A. B. (2017). "Optimization of laccase production by locally isolated Trichoderma muroiana IS1037 using rubber wood dust as substrate," BioRes. 12(2), 3834-3849. Laccases have great biotechnological potential in various industries as they catalyze the oxidation of a broad variety of chemical compounds, diamines, and aromatic amines. The production of laccases by fungi has been broadly studied due to their secretion of enzymes and their growth using cheap substrates. In this study, five native fungi isolates (Dr1, Dr2, Dr4, K5, and K9) were screened for laccase enzyme production. The ability to produce laccase was evaluated based on light green to dark color formation on a potato dextrose agar using 2,2’-azinobis(3-ethylbenzthiazoline-6-sulfonic acid) as an indicator. The highest laccase production was obtained by Dr4, which was identified as Trichoderma muroiana IS1037. Among the different carbon sources tested (rubber wood dust, rice straw, sugar cane bagasse, and oil palm empty fruit bunch), the highest laccase activity (5.84 U/mL) was obtained in submerged fermentation using rubber wood dust as substrate. Laccase production was further enhanced with the addition of 2 mM copper sulfate. In conclusion, the local fungus isolate Trichoderma muroiana IS1037 is a potential fungi-producing laccase that can use rubberwood dust as carbon source. Laccases (EC 1.10.3.2, p-diphenol: dioxygen oxidoreductase) are multi-copper enzymes composed of glycoprotein, which can oxidize a broad range of phenolic compounds and aromatic amines into their corresponding free radicals. The wide range of substrates and the use of small molecules as electron mediators via laccase production allow this enzyme to be widely used in various applications such as in the textile and dye industries, pulp bleaching in paper, food processing, and bioremediation (Kudanga et al. 2011; Manavalan et al. 2013; Sathishkumar et al. 2014 ). In the last decade, the pulp and paper industry has received much attention due to its economic value and resource-intensive nature in relation to its manufacturing process, which is responsible for many environmental issues such as global warming and human toxicity. The most significant environmental implications from this industry result from the pulping and bleaching processes, which lead to the release of chlorinated byproducts, increased COD (Chemical Oxygen Demand) values, and absorbable organic halides in wastewater that eventually result in expensive wastewater treatment and possibly health effects from the mutagenic chloroorganic compounds (Comlekcioglu et al. 2014; Sharma et al. 2015). With increasing concern for an eco-friendly environment, research has been focused on the use of enzymes instead of chemical agents; these include laccases, which are currently very widely applied in delignification and in the bleaching of kraft pulp (Bajpai 2004; Camarero et al. 2007). Laccases act on chromophoric compounds derived from the lignin in all woody and non-woody plants, and they are used in industrial decolorization processes (Champagne and Ramsay 2007; Svobodova et al. 2008). Lignin macromolecules are made up of phenolic (10 to 20%) and non-phenolic (80 to 90%) moieties, and the cleavage of non-phenolic linkages is necessary for lignin degradation. Thakur et al. (2012) observed that laccase enzyme bleaches kraft pulp fibers at alkaline pH using mediator compounds (i.e., HOBT 1-hydroxybenzotriazole) and ABTS (2,2’-azinobis(3-ethylbenzthiazoline-6-sulfonic acid) which improves the physical, chemical, and mechanical properties of pulp and pulp brightness, making the paper white. The extracellular laccase production of fungi during secondary metabolism commonly affects various cultivation conditions (Rivera-Hoyos et al. 2013). With carbon and nitrogen sources being readily available, the concentration induced and the physical parameters are important factors that affect the enzyme production (Majeau et al. 2010). The exploitation of agro-industrial residues as substrates for fermentation processes can add high value to products (i.e. enzymes, ethanol, and single-cell protein), as they are easily available, inexpensive, and contain lignin, which is a natural inducer for laccase formation (Barreto et al. 2007). Moreover, these wastes may contain significant concentrations of soluble carbohydrates, which are efficient in the production of ligninolytic enzymes (Elisashvili et al. 2008a, 2009). The rubber plant is abundant and common in Malaysia, which was the world’s leading rubber producing country until late in the 1980s (Balsiger et al. 2000). Moreover, Ma­laysia still ranks third in the world in terms of rubber plantations (Shigematsu et al. 2011). Rubber wood sawdust is an abundant lignocellulosic material and may be used as a substrate of fermentation for the production of valuable products such as laccase. Fungi such as Ascomycetes, Deuteromycetes, Basidiomycetes, and Trichoderma strains are well known for laccase production (Brijwani et al. 2010; Mathur et al. 2013; Gao et al. 2013; Semra et al. 2013). Therefore, the aim of this study was to investigate the performance of the locally isolated Trichoderma muroiana IS1037 in producing laccase using various lignocellulosic materials as substrates. The fermentation conditions for laccase production using the selected lignocellulosic material were also optimized. The chemicals and reagents used in this study were analytical grade 2,2’-azinobis-(3-ethylbenzethiazoline-6-sulphonate) (ABTS), potato dextrose agar (PDA), monopotassium phosphate, dipotassium phosphate, ammonium nitrate, sodium acetate, asparagine, peptone, and malt extract. All chemicals and reagents were purchased from Sigma-Aldrich (Germany). Magnesium sulfate, thiamine, and bovine serum albumin were obtained from Merck (USA). All solutions were prepared using deionized water. Rubberwood was obtained from Taman Pertanian Universiti Putra Malaysia, and rice straw was sourced from a paddy field in Sekinchan, Selangor. Empty fruit bunch fibers were obtained from a Sri Ulu Langat Palm Oil Mill in Dengkil, Selangor, and sugarcane bagasse was obtained from Sri Serdang, Selangor. Samples of rotted wood with fungus were gathered from various locations in Bangi, Selangor, Malaysia. The fruiting parts of mushrooms that were growing on the rotted wood were collected and carefully rinsed under running tap water. Next, the fruiting mushroom parts were cut into 1- to 2-cm portions and washed several times using sterilized water. The samples were dried and inoculated onto PDA media. These pieces of fruiting bodies were sub-cultured on PDA at 28 ± 2 °C until pure fungal isolates were obtained. Fungal identification was conducted based on colony morphology and structural characteristics observed under light microscopy. The pure cultures were maintained in PDA at 4 °C and sub-cultured every two weeks. The pure fungal strains isolated were inoculated on PDA Petri dishes containing 1% ABTS. The emergence of a bright green to dark green color around the colonies indicated that the fungus was producing laccase. The strain that showed the highest laccase activity was selected for further study. The fermentations for laccase production were done in Erlenmeyer (100 mL) flasks that contained 50 mL of a medium comprising 10 g/L sawdust, 10 g/L malt extract, 2 g/L peptone, 2 g/L yeast extract, 1 g/L asparagine, 2 g/L KH2PO4, 1 g/L MgSO4.7H2O, and 1 mg/L thiamine. Before sterilization, the pH of all media was determined to be 4.5. The flasks were inoculated with 2 agar plugs (5 mm diameter) covered by mycelia from a 4-day-old culture. After 4 days of incubation at 150 rpm and 30 °C, the clear supernatant was collected. The samples were measured daily to determine the laccase activity. The effects of lignocellulosic residues, rubberwood dust, rice straw, empty fruit bunch, and sugarcane bagasse on laccase production by the fungus were studied in a growth medium with a substrate concentration of 1% (w/v) (Arora and Gill 2000). The growth medium was then added with various concentrations of CuSO4·5H2O (0.5, 1.0, 1.5, 2.0, 2.5, and 3.0 mM). The flask without the addition of copper sulfate was maintained as a control. The effect of various nitrogen sources on laccase production was studied. These nitrogen sources included peptone, yeast extract, and malt extract. The nitrogen source used was in the concentration range of 10 g/L of the basal media. Rubberwood dust provided the carbon source in liquid media. Part of the testing procedure included incubating the flasks in a thermostat shaker at 30 °C and 150 rpm. To evaluate the impact of the initial pH of the medium on laccase production, the pH of the composition medium ranged from 3.0 to 7.0. The fermentation was completed in a shaking flask, and enzyme extraction was done on the fourth day of incubation at 30 °C. The impact of temperature on laccase production by T. muroiana IS1037 was investigated via incubation of the flasks at 25, 30, 35, 40, 45, and 50 °C. The fermentation lasted 7 days in a medium of initial pH 4.5. Periodically, samples from the flasks were taken for centrifugation, and the clear supernatant was used to determine the laccase activity. Laccase activity was determined spectrophotometrically by measuring the oxidation of ABTS. The reaction mixture consisted of 700 µL of a 0.2 M sodium acetate buffer (pH 5.0), 100 µL of 0.001 M ABTS, and 200 µL of enzyme solution. The ABTS oxidation was measured at 420 nm (ε420 = 36000 M cm-1) (Bakkiyaraj et al. 2013). The absorbance reading of every sample was recorded at 10-min intervals. One unit (U) was equivalent to 1 μmol of ABTS oxidized per minute, and the activity was presented in U/mL. The protein content of the sample was estimated using the Bradford method; bovine serum albumin was used as the standard (Bradford 1976). The isolated fungal strain was identified and morphologically characterized using different biochemical tests and by using a Biolog kit (Biolog Inc., USA). Single colonies of fungi were prepared according to the standard method (Mchunu et al. 2013). The FF MicroPlate test consists of 96 wells. Each of the wells had a different carbon source, and one well contained water as control. The inoculum for the 96-well FF plates was prepared by using a sterile swab, which was gently rolled over the plate. The spores were suspended in 16 mL of FF inoculum media supplied by Biolog in glass tubes and then mixed gently by hand. After that, 100 μL of the spore suspension was added to each well and the microplates were incubated at 26 °C for 24 to 96 h. Samples were done in triplicates and the readings were taken using the Biolog Microstation. The results were recorded at 24 h after inoculation. After identification of the lignolytic fungi, genomic DNA was isolated. The 18S rRNA gene was amplified by specific primers (Forward: 5’-GTAGTCATATGCTTGTCTC-3’; Reverse: 5’-ATTCCTCGTTGAAGAGCA-3’). The amplified product was sequenced, and the phylogeny of the sequence was analyzed using BLAST sequence analysis software (Shashirekha et al. 2002). muroiana IS1037 mycelia were dehydrated in different concentrations of acetone for 15 min and then subjected to critical point drying to complete the drying process with carbon dioxide as a transition fluid. Then they were coated with gold/palladium. The morphology of the fungus was detected using scanning electron microscopy (SEM) (JEOL JSM-6400, USA) (Alves et al. 2012). Dr4 and Dr2 produced extracellular laccase, as indicated by the green color around the colonies due to the oxidative polymerization of ABTS (Table 1). The other fungal isolates did not show any color change on the agar plates. Trichoderma Dr4 was selected for further study. The ABTS compound was used as a unique laccase substrate in the absence of hydrogen peroxidase. Therefore, the enzymes produced were true laccases. Fig. 1. Trichoderma Dr4. (A) The orange arrow indicates mycelia covering the surface of the PDA plate. (B) The red arrow refers to the spore that flask-shaped under the scanning electron microscope; the blue arrow refers to the sporophore that is carrying the spore. Figure 1 shows the cultural characteristics and morphological arrangement of the Trichoderma Dr4 conidiophores. Trichoderma Dr4 was first grown on an agar plate, where it produced abnormal compact colonies with irregular margins. The Trichoderma isolate was predominantly effuse and covered the entire surface of the plate with whitish to light green conidial pigments (Fig. 1A). Under a scanning electron microscope (SEM), the Trichoderma Dr4 exhibited branches and spores that accumulated in balls with smooth walls. This sporophore carried many monophialidic flask shapes (Fig. 1B). Biochemical testing was also conducted using a FF microplate identification system. 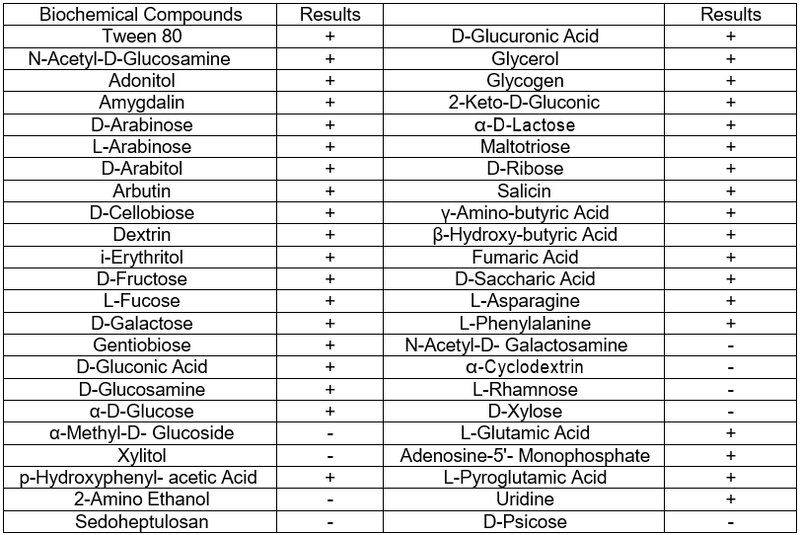 The result showed 96 different carbon sources; the Dr4 isolate preferred several biochemical compounds that gave a positive result (Table 2). According to the database, the fungus was identified as T. muroiana. Figure 2 shows the phylogenetic tree that was constructed on the basis of the linkages of the Dr4 strain. The 18S rDNA analysis identified Dr4 as Hypocrea (Trichoderma) with 99% sequence similarity. The identification of strain IS1037 was completed using the 18S rDNA gene sequence and deposited in the GenBank database. Strain IS1037 had many similarities with genus Hypocrea, Hypocrea muroiana JN941682.1, Hypocrea koningi HM152770.1, and Hypocrea rufa AJ301991.1, with a homology of 99%. Thus, type isolate Dr4 was identified as Trichoderma muroiana IS1037. The positive fungal species T. muroiana IS1037 and the fungus isolate Dr2 were selected for this stage of the study. 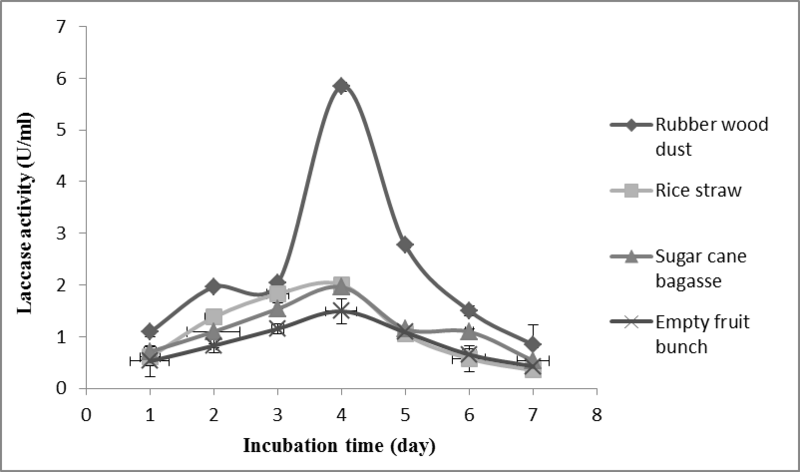 The two species were used to determine laccase production via submerged fermentation (Smf) after four days of incubation. The laccase activities started on the first day of incubation for T. muroiana, while Dr2 activities started on the second day. 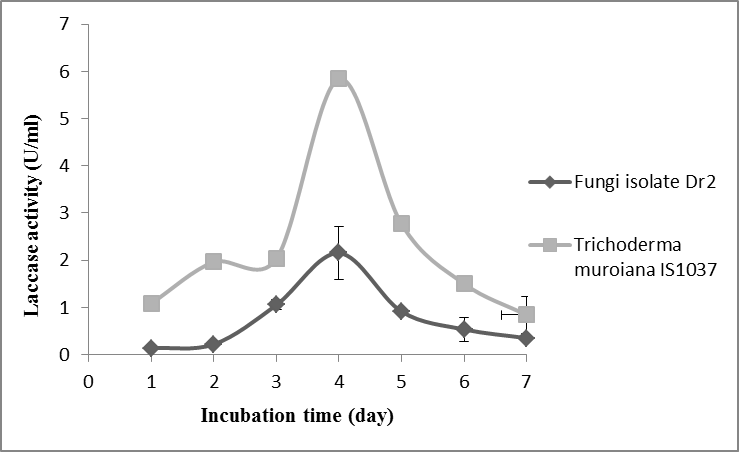 The maximum laccase production from T. muroiana and fungus isolate Dr2 was obtained at four days of incubation with an enzyme activity of 5.8 U/mL and 2.1 U/mL, respectively (Fig. 3). Fig. 3. Extracellular laccase production by T. muroiana IS1037 and fungi isolate Dr2. The values are means of 3 replicates with ± SD. Fig. 4. The time course of laccase production by Trichoderma muroiana IS1037. The values are means of 3 replicates with ± SD. The time frame for laccase production by Trichoderma muroiana was evaluated using the rubberwood dust as a carbon source in basal media. Laccase activity gradually declined on the fifth day, while the specific activity was increased up to 45.0 U/mg on the sixth day (Fig. 4). 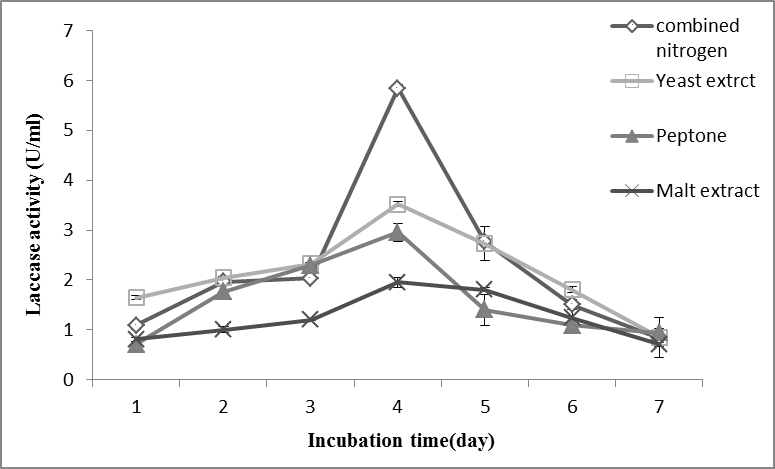 Previous studies showed maximum levels of laccase production between 2 and 4 days of incubation of T. harzianum and T. viride. 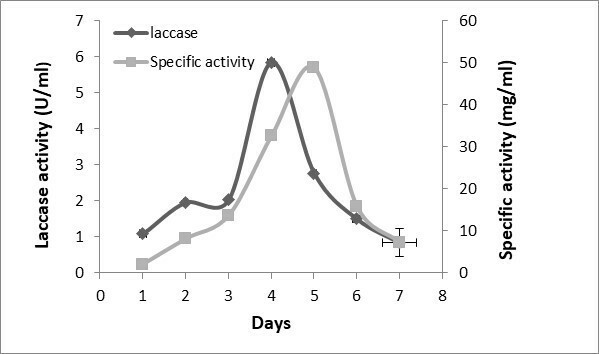 Moreover, the specific laccase activity was increased due to maximum protein released at day 7 in a fully sporulated culture (Sadhasivam et al. 2008; Divya et al. 2013). This could have been due to laccase activity that accumulated during vegetative growth (matching the mycelial mass), but it showed a rapid decline shortly after the fruit body began to form (Thurston 1994). Selecting the lignocellulosic substrate under submerged fermentation is crucial for the efficient and economical production of ligninolytic enzymes. Various lignocellulosic substrates including rubberwood dust, rice straw, bagasse, and oil palm empty fruit bunch were screened for laccase production by T. muroiana IS1037. Of these substrates, rubberwood was the most appropriate for laccase production (5.8 U/mL) on the fourth day of incubation (Fig. 5). Due to the presence of high cellulose (42.97%), hemicellulose (31.93%), and lignin (21.17%) content in the rubberwood, it was considered a balanced substrate for microorganisms (Ahmadu 2012). Rubberwood dust is abundantly available in Malaysia, and this substrate could be used as a carbon source for laccase production. Moreover, lignocellulosic waste utilization could play a vital role in solving environmental waste disposal problems (Bajaj et al. 2011). Table 3 illustrates laccase production by different species of fungi grown using different types of substrates. Fig. 5. Effects of different types of substrates on laccase production by T. muroiana IS1037. The values are means of 3 replicates with ± SD. Generally, laccase production is achieved by using a limited carbon and nitrogen ratio or a higher carbon and nitrogen ratio in the cultivation medium (Buswell et al. 1995; Monteiro and De Carvalho 1998). The impact of the nitrogen source on the laccase production of various organisms is highly controversial (Collins and Dobson 1997). The findings of the present study showed the influence of various nitrogen sources on laccase production by T. muroiana IS1037, which was grown on 10 g/L wood dust in a basal medium of pH 4.5 at 30 °C (Fig. 6). Fig. 6. The effect of different nitrogen sources on laccase production by T. muroiana IS1037. The values are means of 3 replicates with ± SD. The highest enzyme production at 5.8 U/mL was achieved via the combination of nitrogen source (yeast extract, peptone, and malt extract) in the cultivation medium (Fig. 6). The single nitrogen source that was used to support the growth of fungi resulted in low laccase production. A few researchers reported mixed nitrogen sources for the production of laccase that gave higher productivity than single nitrogen sources. T. hirsute produces the greater laccase activity when using a combined nitrogen source (CNS) (Bakkiyaraj et al. 2013). The impact of initial pH on laccase production is shown in Fig. 7. The pH of the culture medium ranged from 3.0 to 7.0. The ideal activity was obtained in the pH range of 3.0 to 4.5, and the maximal laccase production (5.8 U/mL) was attained at pH 4.5. Additionally, an increase in pH resulted in a decrease in the enzyme yield. This could have been due to the weak mycelial growth at a higher pH, which also could have hampered the laccase productivity. Ang (2007) reported similar results with maximum enzyme production by Pycnoporus sp. at pH 4.5. In contrast, a study by Kuntal et al. (2013) found that the optimum initial pH for laccase activity was 4.5 to 5.5. 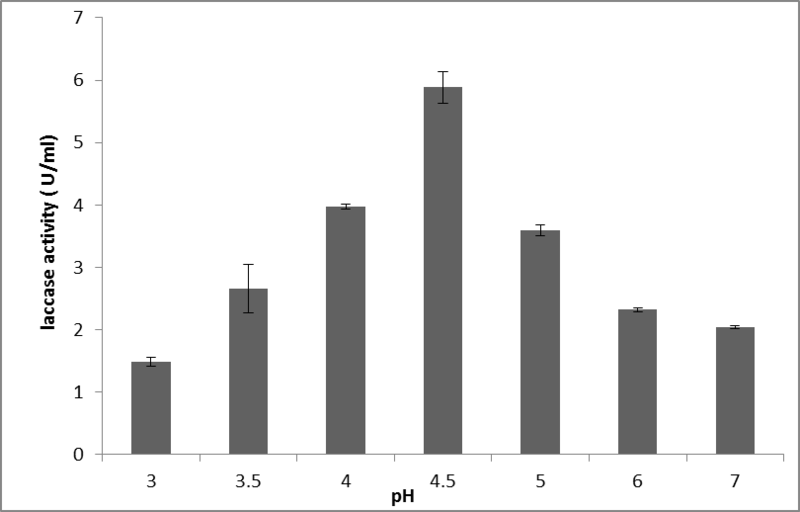 However, the ideal value of pH differs depending on the substrate because a different substrate produces different reactions for laccase production (Shraddha et al. 2011). Fig. 7. The effects of initial pH on laccase production by T. muroiana IS1037. The values are means of 3 replicates with ± SD. The incubation temperature is a crucial factor that affects the fermentation process in SmF because both the fungal growth and enzyme production are sensitive to temperature. To examine the impact of temperature on laccase production, T. muroiana IS1037 was grown in the temperature range of 25 to 30 °C. The maximum production of laccase (5.8 U/mL) was obtained at 30 °C (Fig. 8). Shraddha et al. (2011) reported that there were limitations to the impact of temperature in laccase production and that the optimal temperature of laccase differed significantly depending on the strain. 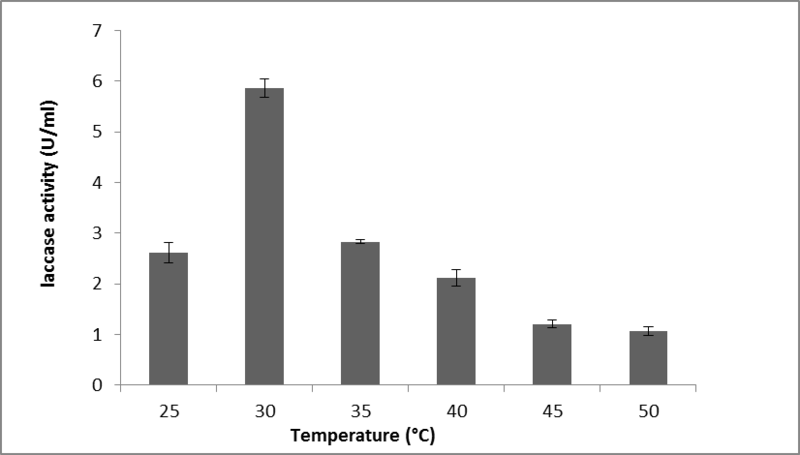 The optimum temperature range for laccase production by Pycnoporus sanguineus was from 25 to 30 °C, whereas the ideal temperature for laccase production by Trichoderma harzianum was 35 °C (Pointing et al. 2000; Rehan et al. 2016). Fig. 8. The effect of temperature on laccase production by T. muroiana IS1037. The values are means of 3 replicates with ± SD. Fig. 9. 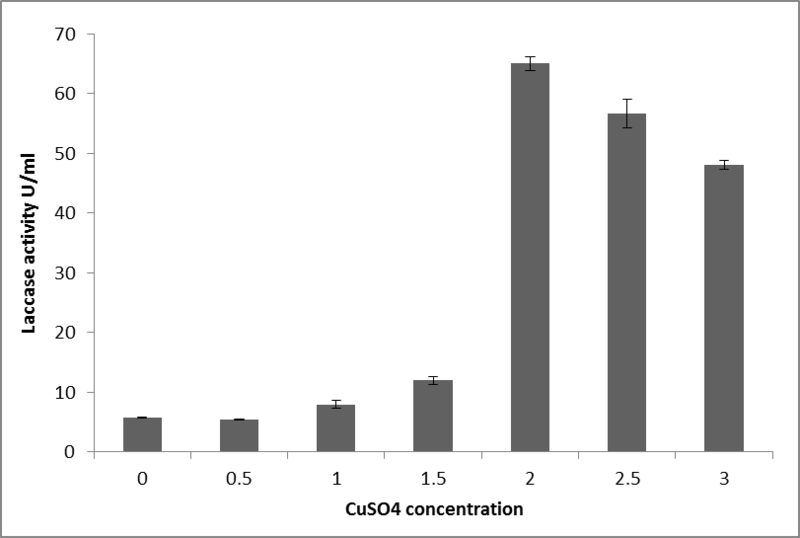 The effects of different concentration of CuSO4 on laccase production by T. muroiana IS1037. The values are means of 3 replicates with ± SD. The formation of enzymes in microorganisms is frequently boosted by some low molecular weight compounds that act as inducers. It is also possible for laccase to be promoted by phenolic or aromatic compounds linked to lignin or lignin derivatives including ferulic acid, guaiacol, and veratryl alcohol (Revankar and Lele 2006). A few reports have indicated that copper is a micronutrient that plays a major role in laccase production by white-rot fungi, but the toxicity of the majority of the inducers and copper can be harmful to fungal growth and enzyme production if their presence is excessive (Birhanli and Yesilada 2006). The impact of various amounts of copper sulfate (0.5, 1.0, 1.5, 2.0, 2.5, and 3.0 mM) on laccase production using T. muroiana IS1037 was evaluated (Fig. 9). Compared with the control (without inducer), all concentrations of copper sulfate enhanced laccase production. The highest laccase activity of 65.0 U/mL was achieved from 2 mM copper sulfate during the fourth day of fermentation, while the lowest laccase activity was captured around 5.8 U/mL in the control test (without any CuSO4). This result was quite similar to another report for laccase production by Pleurotus ostreatus (ACCC 52857), which found increased laccase activity in 2 mM copper sulfate (Changwei et al. 2016). Therefore, the addition of copper sulfate (2 mM) to the culture medium had a noticeable impact on laccase production. Trichoderma muroiana IS1037 showed a high laccase production of 5.8 U/mL on the fourth day of submerged fermentation. Laccase production increased by 11-fold when 2 mM copper sulfate was added to the fermentation media. The authors thank the University Putra Malaysia for financial support grant No. 9413402 and the Faculty of Biotechnology and Biomolecular Sciences, University Putra Malaysia, for facilities and technical support. Ahmadu, A. F. (2012). Bioethanol Production Using Lignocellulose Biomass Hydrolysate from Indigenous Fungi Fermentation, Master’s Thesis, Institute of Bioscience, Universiti Putra Malaysia. Alves, E., Lucas, G. C., Pozza, E. A., and Alves, M. C. (2012). “Scanning electron microscopy for fungal sample examination,” in: Laboratory Protocols in Fungal Biology: Current methods in Fungal Biology, V. K. Gupta and M. G. Tuohy (eds. ), Springer, Heidelberg, pp. 133-150. Ang, K. N. I. (2007). Production of Laccase by a Locally Isolated Fungus for Biodegradation of Selected Agro Wastes, Master’s Thesis, Biotechnology and Biomolecular Sciences, University Putra Malaysia. Bajpai, P. (2004) “Biological bleaching of chemical pulps,” Critical Reviews in Biotechnology 24, 51-58. Bakkiyaraj, S., Aravindan, R., Arrivukkarasan, S., and Viruthagiri, T. (2013). “Enhanced laccase production by Trametes hirusta using wheat bran under submerged fermentation,” International Journal of ChemTech Research 5(3), 1224-1238. Balaraju, K., Kyungseok, P., Shamarao, J., and Kaviyarasan, V. (2010). “Production of cellulase and laccase enzymes by Oudemansiella radicata using agro wastes under solid-state and submerged conditions,” Research in Biotechnology 1, 21-28. Balsiger, J., Bahdan, J., and Whiteman, A. (2000). The Utilization, Processing and Demand for Rubberwood as a Source of Wood Supply, APFC-Working Paper No. APFSOS/WP/50, FAO, Bangkok. Bradford, M. M. (1976). “A rapid and sensitive method for the quantitation of microgram quantities of protein utilizing the principle of protein,” Dye Binding Analytical Biochemistry 72, 248-254. Trametes versicolor,” Applied Environment Microbiology 63, 3444-3450. Comlekcioglu, U., Tutus, A., Cicekler, M., Gunes, M., and Aygan, A. (2014). “Application of recombinant xylanase from Orpinomyces sp. in elemental chlorinefree bleaching of kraft pulps,” Romanian Biotechnological Letters 19(1), 8941-8950. Kuntal, K., Rohit, C., Mohd, S., and Sarita, S. (2013). “Isolation of laccase producing Trichoderma sp. and effect of pH and temperature on its activity,” Journal of ChemTech Research 5, 974-4290.
do Rosario Freixo, M., Karmali, A., and Arteiro, J. M. (2008). “Production of laccase and xylanase from Coriolus versicolor grown on tomato pomace and their chromatographic behaviour on immobilized metal chelates,” Process Biochemistry 43, 1265-1274. Mathur, G., Nigam, R., Jaiswal, A., and Kumar, C. (2013). “Bioprocess parameter optimization for laccase production in solid state fermentation.” Journal of Biotechnology and Bioengineering Research 2231-1238(4), 521-530. Mchunu, N., Permaul, K., Alam, M., and Singh, S. (2013). “Carbon utilization profile of a thermophilic fungus, Thermomyces lanuginosus using phenotypic microarray,” Advances in Bioscience and Biotechnology 4 24-32. Rafaella, C. B. S., Lucia, R. D., Manuela, d. S. and Lara, D. S. (2010). “Production of laccase, manganese peroxidase and lignin peroxidase by Brazilian marine-derived fungi,” Enzyme and Microbial Technology 46, 32-37. Rivera-Hoyos, C. M., Morales-Alverez, E. D., Poutou-Pinales, R. A., Pedroza-Rodriguez, A. M., Rodriguez-Vazquez, R., and Delgado-Boada, J. M. (2013). “Fungal laccases,” Fungal Biology Reviews 27 (3-4), 67-82. Semra, S., Nese, A., and Inci, A. (2013). “Studies on laccase activity in the filamentous fungus Trichoderma reesei,” Journal of Biology 72(2), 37-42. Thurston, C. F. (1994). “The structure and function of fungal laccases,” Microbiology 140, 19-26. Article submitted: December 11, 2016; Peer review completed: March 12, 2017; Revised version received and accepted: March 30, 2017; Published: April 12, 2017.